Sadly, the proud times of a neutral and self-respected Sweden are gone. Gone when the dignified and cherished PM Olof Palme was assassinated after a hate-campaign led by Carl Bildt’s party and the right-wing media which represents their interests. But in recent years the subservience to a foreign power by Swedish politicians has gone not only way beyond the limits of decency. 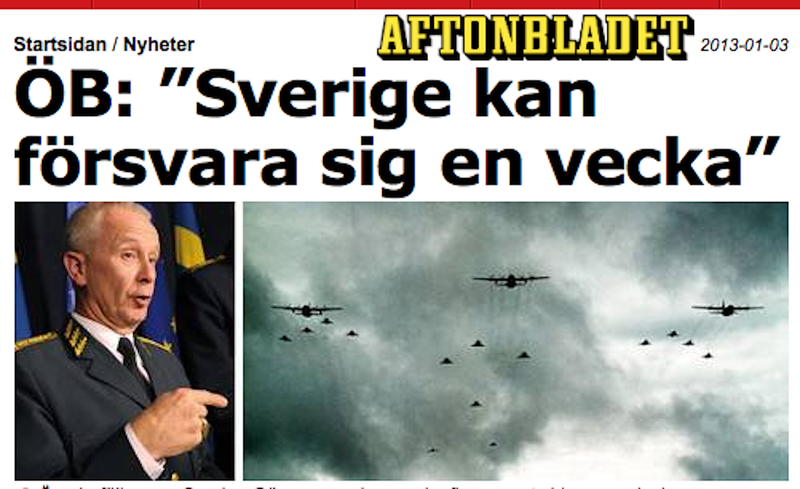 It has put the national security of the country at severe risk, and the destiny of all Swedes at stake. The Russian-phobic declarations of Minister Carl Bildt are not the only, or the most serious provocations that could represent “casus belli”; the activities of FRA (a cyber-espionage agency apparatus established at the request of US) targeting Russian leaders on behalf of US Intelligence can be viewed as an act of war, according to Prof. Wilhelm Agrell, a Swedish expert. There are countless events that illustrate the subservience towards the political and financial elites of superpower USA, from the part of the Swedish government – mainly represented by Swedish Foreign Minister Carl Bildt. I started to be aware of this phenomenon some years ago, when analyzing the active collaboration of the Swedish government in the USA/NATO occupation of Afghanistan. About the same time, by 2008, discussions on the surveillance legislation put forward by the Swedish government – which as it was known relatively recently was in fact a request from the US administration – evidenced that the primary goal was not to fight “terrorism”. 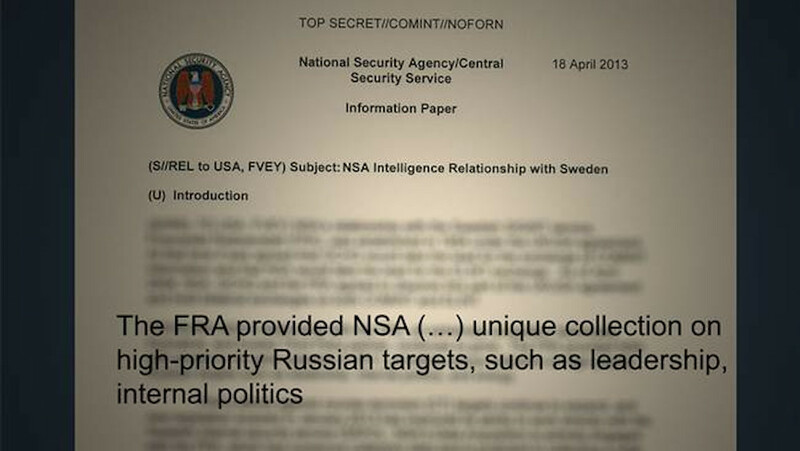 One aim was the blunt spying on Swedish citizens on behalf of the US agencies. That was a decision illegally taken without the consent, or even knowledge, of the Swedish Parliament. WikiLeaks denounced this, and for which has never been forgiven-either-forgotten by the No 1 exposed Swedish politician, Mr Carl Bildt, later denounced as an old-time US informer. As a matter of fact, and exactly as we had put forward during the 2008 debate, it was later demonstrated (2013) that the FRA-legislation was a direct request by the US government to Sweden, which the politicians at the Swedish government docilely complied, and again lying to the Swedish people. Further, when analyzing the diathesis of the Swedish case against WikiLeaks and its founder Julian Assange, the puppet-panorama emerged in nakedness. That the “Assange prosecution-case” might have simply been a request from the US government is not any longer an assumption. 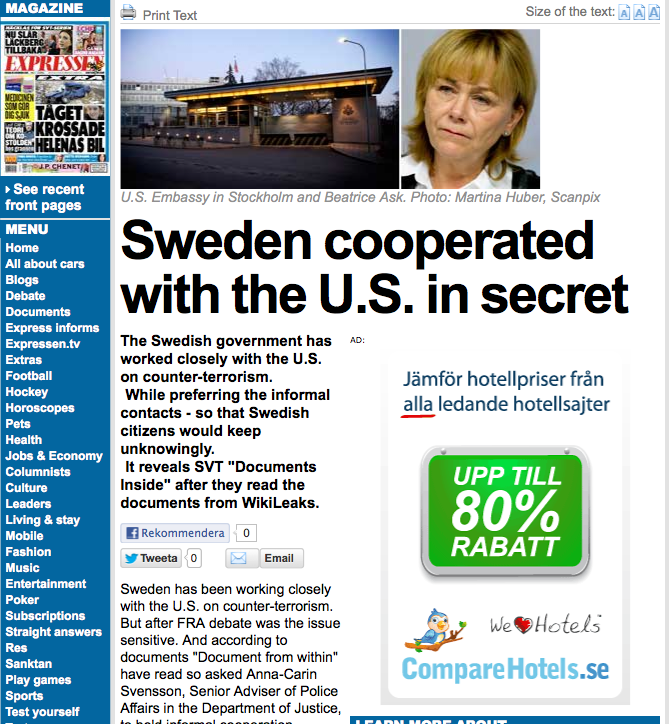 Moreover, the facts, confirmed by the Snowden documents, demonstrate that Sweden was the ONLY government that complied with the US government request of August 2010, and directed to all countries with occupation forces in Afghanistan [See “Was the reopening of the Sweden case, part of the US request to prosecute Assange by any means?“]. The anti-Russia provocations are not only contained in the xenophobic declarations of Carl Bildt [See for instance “A Swedish Extremist Right-wing “Diplomacy”? Or Bildt’s Support To Ukraine Nationalists?“]. In December 2013 it became known that FRA (the Swedish version of NSA; in fact, working for NSA) has been a conspicuous active part of Quantum. Quantum is “an American system for data penetration which is very much advanced. If used offensive against another country it can be considered as an act of war by the country-target”. This is the main content of a warning issued by Sweden most respected Conflict-science scholar, Prof. Wilhelm Agrell. In the context, it was also revealed that Sweden is the outpost for the surveillance of Russia on US behalf. FRA even spy on Russian leaders. The images below are from a NSA document dated 8 April 2013, from the Edward Snowden collection. All these provocations at the same time that the military capability to contest to an eventual retaliation from the offended country (Russia in this case) is quite precarious. In fact, Swedish Armed Forced Commander has declared that Sweden would not be able to last more than one week in combat. 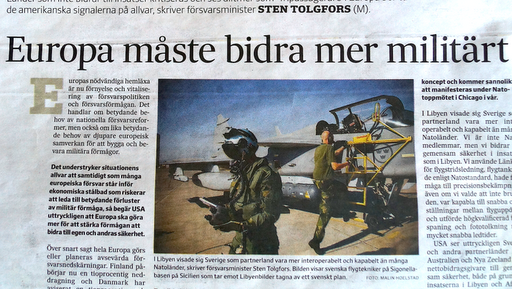 And what was FRA supposed to be, “really”, according to the version given by Carl Bildt? 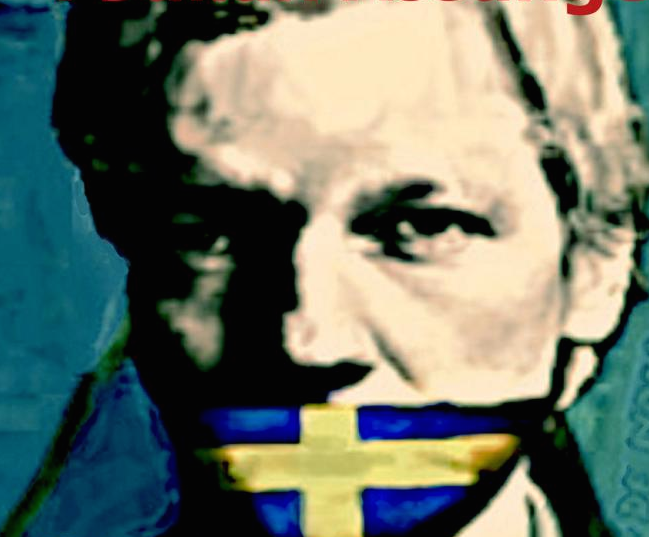 During 2012-2013, exposures after exposures originated in international sources such as WikiLeaks and other media outlets (nor Swedish media reports) revealed the extent of the secret cooperation between the US Intelligence apparatus and the Swedish government. Collaboration that in many instances the Swedish government kept secret even towards the Swedish Parliament [See “Who is behind the “people’s Intelligence apparatus”? 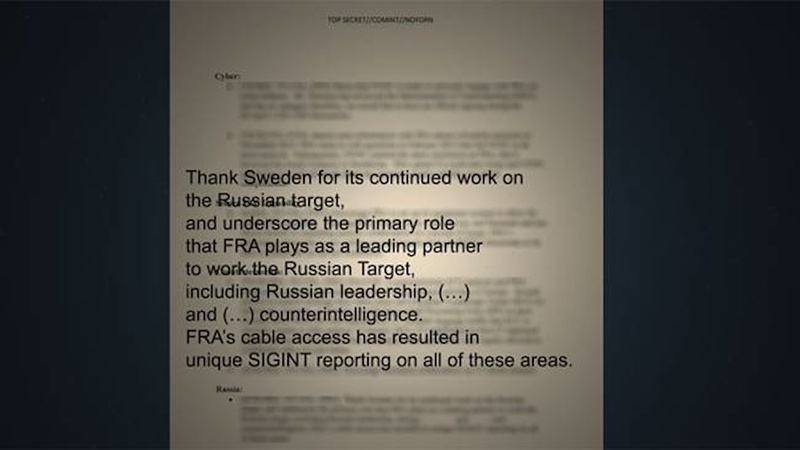 On the Swedish collaboration with US spying“]. This collaboration, said to fight terrorism, became exposed as a systematic surveillance of all Swedes at the request of US agencies. 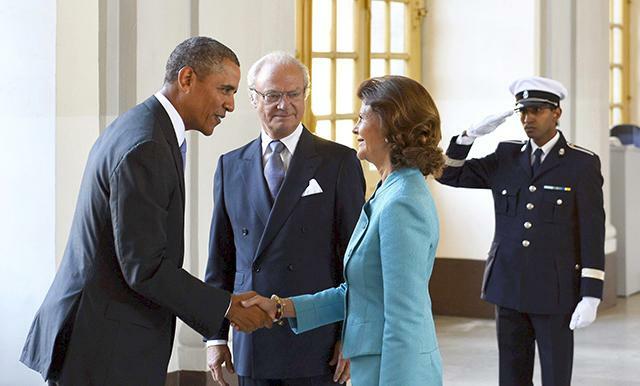 And when President Obama, in a visit to Sweden that “was never meant to exists” (it was in fact a forced stopover in Sweden decided by the US administration “at last-minute”, as an alternative-stopover after Russia’s has given asylum to Edward Snowden), the subservience of the Swedish political and cultural elites crossed all border of decency and self-respect. While the hypocritical Royal house (“Royalty” discussed in an upcoming column in Professors blogg) posted a coloured immigrant as “Royal guard” just for the show off President Obama [see picture above], the main morning paper DN headed in a full first page: “Welcome to little USA, Mr President”! 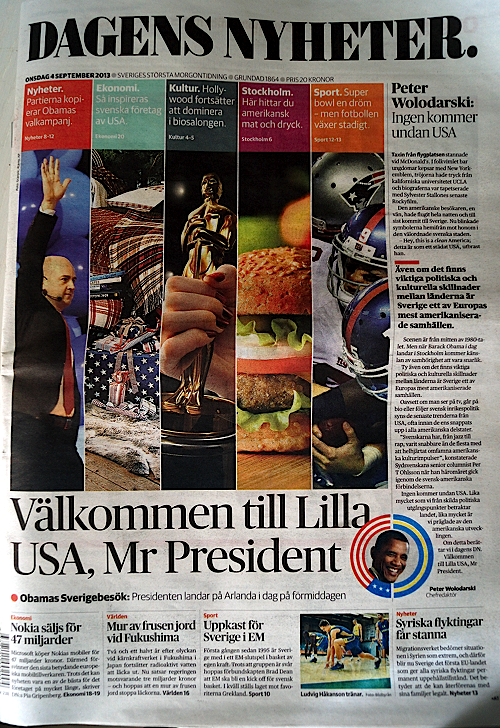 But not enough with the tasteless subservience, the images at he front page of the supposedly most serious Swedish paper had a full display of the American hamburger, the American flag, the American football, and the American Hollywood, all portrayed at the same height of Sweden‘s PM Reindfeldt. Recently, when the Snowden documents revealed that NSA conducts spying on the offices of the EU governments – and even listens to their telephones – almost all EU-leaders reacted with indignation. But of course NOT Sweden. The Swedish government did not even commented voluntarily on the issue. Carl Bildt, predictably, defended in vague terms the need of governments to conduct intelligence & surveillance as a normal procedure. However, when the time for actual political decisions did arise, the Swedish government exposed its complete subservience towards the US – and turned its back to Europe – when opposed the inclusion of the NSA spying of EU governments in the agenda for upcoming US-EU discussions on trade. The article,  published the day after of the afore mentioned debate, ensued with statistics showing the thematic distribution of partisan interventions on foreign policy done in the Parliament during the last decade. But it was not clear difference among the Swedish parties. This is the country were even the former feminist Communist Party, which changed the name to “Vänster” (means “Left”), voted for Carl Bildt’s proposition of sending jet fighters to Libya, and most recently, announced its support for the Swedish participation with troops in the military occupation of Mali. One important aspect in this “deformity” consisting in, according to Anna Jardfelt (CEO of the Swedish Foreign Policy Institute), that Sweden is taking part militarily, with troops, in regions of the world that are not in the political priorities of Sweden.This military participation of Sweden, said of being implemented in the frame of EU-cooperation, it basically corresponds to operations of NATO-design and under US operative command. Paradoxically, “Neutral” Sweden has revealed itself in the last years being the closest collaborationist European country of the Bush and Obama government – way closer than Scandinavian countries with full membership in NATO. After the Edward Snowden exposures, Sweden has been referred in the international media as to “the Sixth Eye” of the SIGINT alliance under US command. 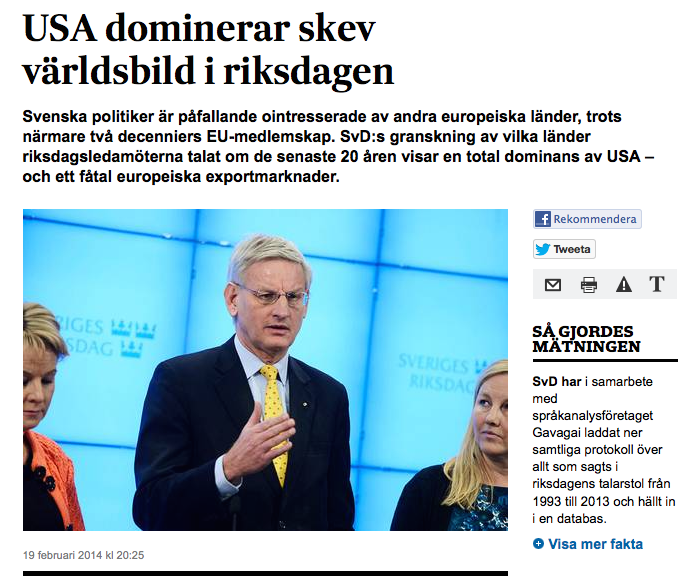 “USA dominerar skev världsbild i riksdagen”, SvD, 19 Feb 2014. It’s shocking, indeed, that fascists have come into a European government, with the encouragement of US and Western European leaders. (If radical leftists had been the fighting vanguard in the maidan, Yanukovych would have been America’s “democratic” hero.) They’re ideological heirs of Stepan Bandera, a Nazi collaborator whose organization idea of “nationalism” was circulating pamphlets telling Jews: “We will lay your heads at Hitler’s feet.”Nothing “neo” about it. Unfortunately, the mythologization of Bandera and his “nationalist” ideology has been a systematic effort by poet-Soviet Ukrainian governments, making western Ukraine fertile ground for these guys. Consider the stunning turn of events we have just witnessed: “the ascension of a genuinely fascist mass movement into the corridors of power” in a European country for the first time since WWII. Ukraine now has a government that is, as Eric Draitser puts it, “essentially a collaboration between pro-EU liberals and right wing ultra-nationalists.” Might we interrupt the rejoicing over the rebirth of democracy in Ukraine to ask: Have the US and European governments given a thought to how their embrace of a government including Svoboda and Right Sector in Ukraine implicitly legitimizes and emboldens the far-right and neo-Nazi movements in Britain, and France, and Sweden, et. al.? Because those movements have. Thank you very much for this site and your viewpoint. I am Danish and lived and worked for 45 years in Africa and Asia and only came back to DK 1 1/2 years ago… lovely to be home, but for the Danish Foreign Policy. And I was shocked over Sweden’s Carl Bildt. Seems he has been totally brainwashed by the USA, maybe he should emigrate and take up US citizenship. He is not good for Sweden or Norden or EU.